For those of you that don't know me, I do not like complicated. This is one of the main reasons that I do not like to bake, but love to cook. 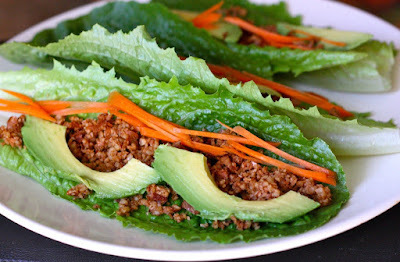 For me cooking allows me to be creative, inventive and even adventurous. I love being able to scour my cupboards to find the perfect ingredients to make a tasty dish. First, let me start off by saying I did a little organizing in my kitchen paying special attention to my spice collection. I discarded any old outdated spices and discovered a world of culinary adventure sitting in my cabinet. I had exotic spices I didn't know what to do with! My quest begin for a new inventive recipe. I chose a spice called RAS EL HANOUT. Although the name may be daunting, this spice actually contains coriander, paprika, cardamom, cinnamon, black pepper, red pepper, turmeric, ginger, nutmeg, clove and allspice in one little bottle. 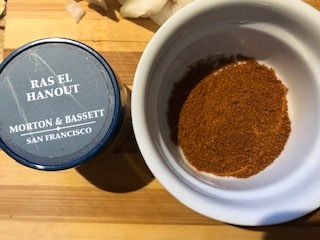 In during some research, Ras el Hanout means "top of the shop" and has roots in North Africa. For North African souks, or spice merchants, it is a point of honor to have the most sought after version of this blend. Varieties of this blend can have up to 50 ingredients. This spice mix can also be found in Morocco, Algeria and Tunisia. The amazing thing is there is no definitive composition. I wanted to make a vegan dish that provided a substantial amount of protein so I decided to experiment with dried split peas. 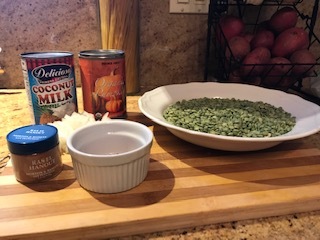 Typically I have only used them to make the traditional split pea soup but wanted to try something new. In case you didn't know split peas are very low in fat and are a good source of protein. 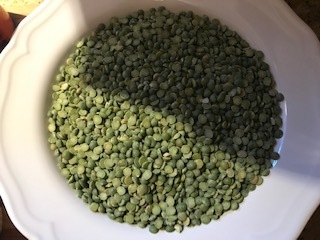 A 1/2 cup of cooked split peas contains less than 1 gram of fat and has 8 grams of protein. 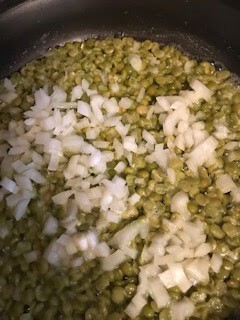 Cook split peas in 6 cups of water until the water evaporates then I added another cup and a half of water and the chopped onion. 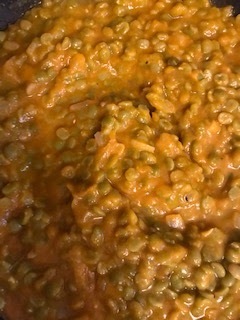 At this point the split peas were chewy. 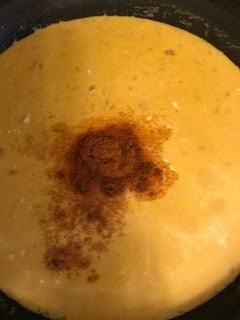 After it cooked down a bit I added the canned pumpkin, coconut milk and a heaping teaspoon of the spice and gave it a stir. The consistency was now similar to a soup. At this point you have options since you can enjoy this as a soup or a sauce. I chose to add the rice into the mixture so the rice would absorb all the rich flavors and make it a main course. 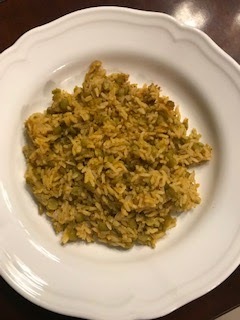 An alternative would be to cook the rice separately and incorporate it later on or you do not need to add the rice at all. This is what I love about cooking there is no right or wrong. If you like more spice you can always add it, you have complete control! Hope you enjoy and please let me know what you think of this dish, would love to hear your thoughts and variations. Being it is the start of the new year and it seems everyone is busy cleaning, purging and looking to freshen things up. I want to share a great tip with you. My loveseat was worn and I have cats with claws so I don't need to say more. So my options were to replace it, buy a slipcover or have it reupholstered. I called to see how much to redo it and was blown away by the cost of the fabric alone. The cost was three times what I paid for the loveseat. Sometimes you can find solutions to your issues in the most unorthodox places like a hardware store. I was quoted $30.00 a yard (which I was told was a bargain) for material and I would need somewhere in the neighborhood of 12 yards. 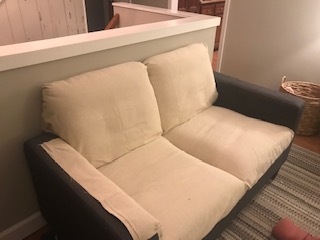 I purchased two painters drop cloths for $29.99 each and am using those to not only reupholster the loveseat but my dining rooms chairs and an ottoman. Creativity is the key here folks. It really pays to think out of the box. Here is a picture of the loveseat, as you can see it is a work in progress. I can't wait to share the finished results of these projects in my upcoming posts. Finally please remember to be kind, it costs nothing and means more than you think. Till next week, Adopt don't Shop and keep sharing those posts because lots of great pets need homes!